You can see this picture everywhere on the web. 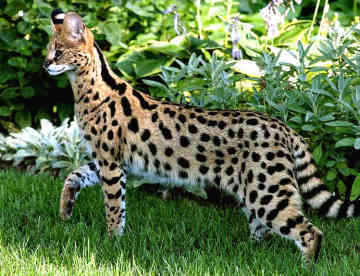 Many breeders use it to show the beauty of the serval. DNA analysis showed that the serval came from the same ancestor as the lion, but it constitutes a unique lineage having no close relationships with other cat species, although he presents some common points with the cheetah. 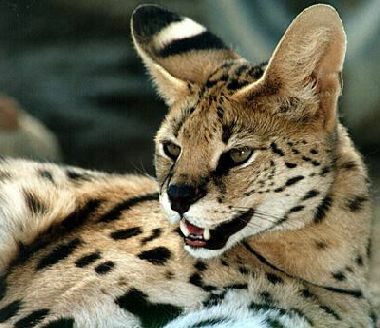 However, other studies indicate that the serval is close to the African golden cat and the caracal. This African cat is about 85 to 112 cm in length, having a long 30 to 50 cm thick tail and a height at withers from 54 to 66 cm. It weighs varies between 9 to 16 kg for females, and 12 to 26 kg for males. He has long legs, slender head with large rounded ears. 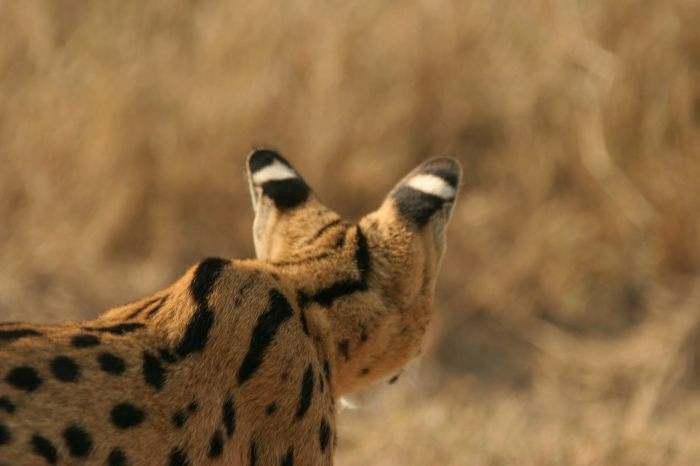 The serval’s ears and its long neck help him to hear and see over tall grass in the african savanna. 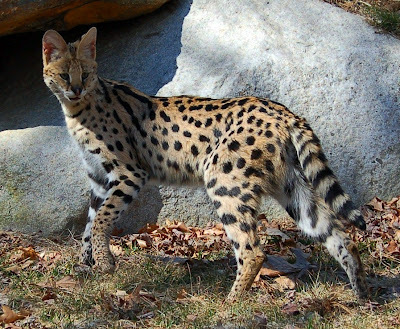 The appearance of the fur is variable: while most Servals wear multiple spots like the cheetah, some have only visible markings above the eyes and on the tail. They have the distinction of having two white spots on the back of their ears which remind us of a second set of eyes. The serval average lifespan is 20 years. It can purr and meow like the usual domestic cat does but can also spit and growl like a wild cat. In order to hunt more effectively in tall grass of the African savanna, the serval has very long legs (the longest in cats compared to body size). It can run up to 80 km / h. Its long legs and neck also allow him to look over tall grass, whereas its large ears hear prey as they move underground. While hunting, the Serval can stand still for almost 15 minutes; eyes closed by listening their prey in the surroundings. 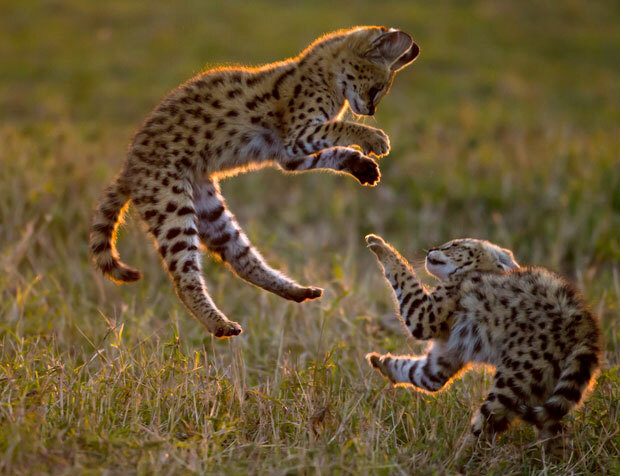 Having located its prey, generally at twilight, and often thanks to its hearing, the serval jumps with dexterity. He makes jumps four feet long, and over a meter high before striking its victim with his front legs. His jumping ability allows him to catch birds in flight. His jumps can sometimes reach three meters in height or six feet long. 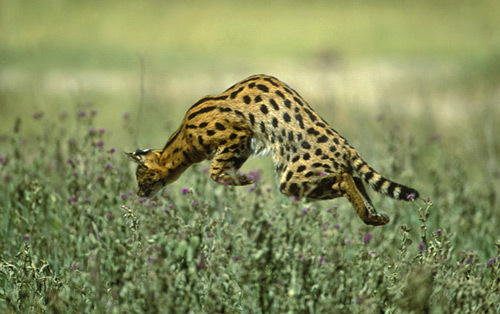 The Serval is a very effective hunter, managing almost 50% of his attempts (with an overall success rate of 67% per night), whereas most of the big cats do not succeed more than 10%. 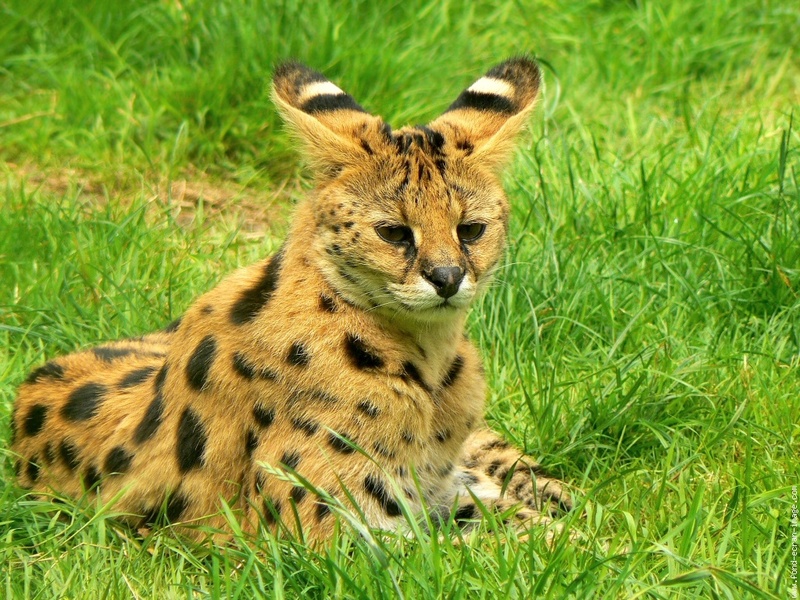 The serval often plays with his prey for several minutes before eating. Most of the time, they fiercely guards their food against other predators; males are often more aggressive than females. The female serval has a gestation period of 66-77 days, between 2 months and 2 ½ months. Once or twice a year, she gives birth to a litter of two or three cubs. They are raised in sheltered locations such as abandoned burrows of ground hogs. If such a place cannot be found, a space between shrubs or a nest of grasses may be sufficient. 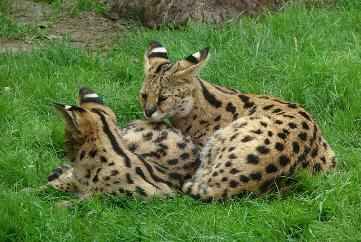 Servals, like cheetahs, are generally friendly and easy to domesticate. The Ancient Egyptians worshiped him as a god just like cats. Some of them are domesticated and strongly bound to their master. They do not easily accept changes and might not welcome newcomers; they can have wild behaviors when separated from their masters. When crossed with a domestic cat, cubs are called Savannah. The serval can be sometimes the leopards prey and they were extensively hunted for their fur by man. They can still be found in East and West Africa, but have disappeared from the Cape Province in South Africa and are increasingly rare in the northern Sahara.